PlanetCNC TNG software recognizes all PlanetCNC controllers that are connected to your PC trough USB or Network ports. However, only Mk3 series of controllers (Mk3, MK3/4,MK3DRV,Mk3ECO) can be used with TNG sw. It is essential that user sets primary controller. Select the type of connection that you wish to use with your controller: USB or Network. 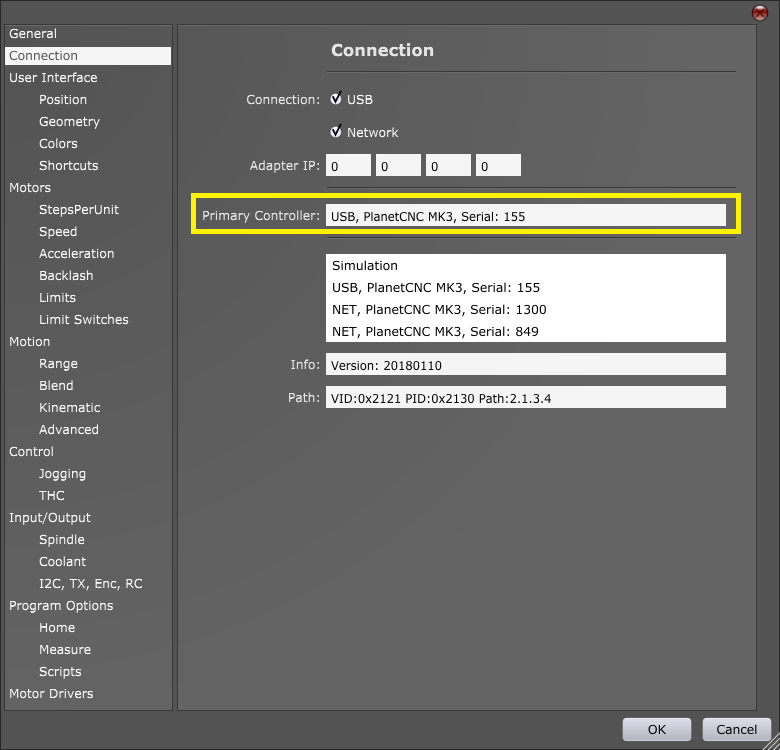 To select your primary controller, you need to double click on controller displayed in device list. 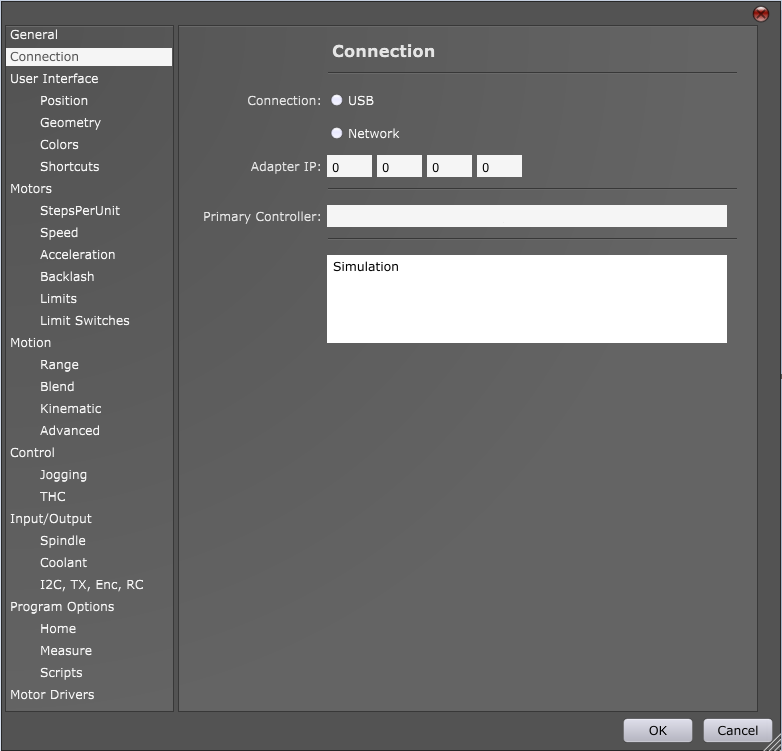 “Primary controller” window will now display type of connection, type of controller and its serial number. Now that your primary controller is selected you can observe its status via connection light. 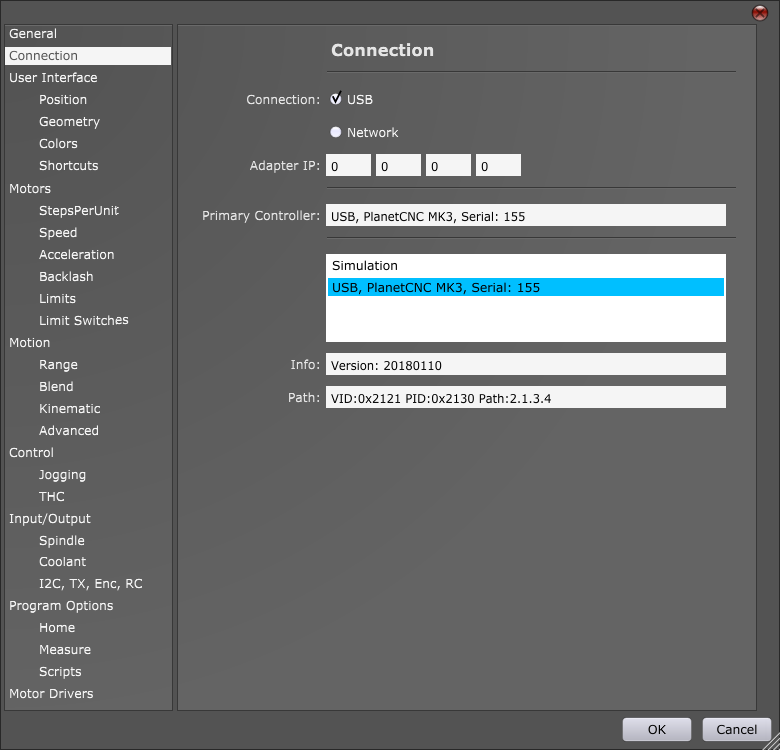 If you look closely at the bottom right corner of PlanetCNC TNG software you will notice that there is a round light. This light can be lit in various colours and each colour indicates different connection, firmware and license status. Green light indicates that controller is updated with correct firmware version, it is set as primary controller and is activated, meaning license is found by software. Green light with X indicates that controller is updated with correct firmware, it is set as primary controller but software does not find proper license for connected controller. Orange light indicates that controllers firmware version is not correct. Update firmware of controller. Gray light indicates no communication between controller and software. Click “Machine/Controller/Reconnect” and make sure that correct controller is set as Primary controller in settings. Red light indicates that software is processing commands and is sending them to controller. Communication status can also be indicated by observing on-board Link LED. If this LED is blinking in pattern of approximately 500ms, controller is communicating with software. When software is processing commands and is sending them to controller, this LED will be blinking even faster. If Link LED is not blinking, this indicates communication has dropped.